TS-DW Thermo–Shaker is designed for shaking and incubating deep well plates. A multisystem principle, used in the design of the Thermo-Shaker, allows operating it as 3 independent devices: Incubator, Plate shaker and Thermo–Shaker. 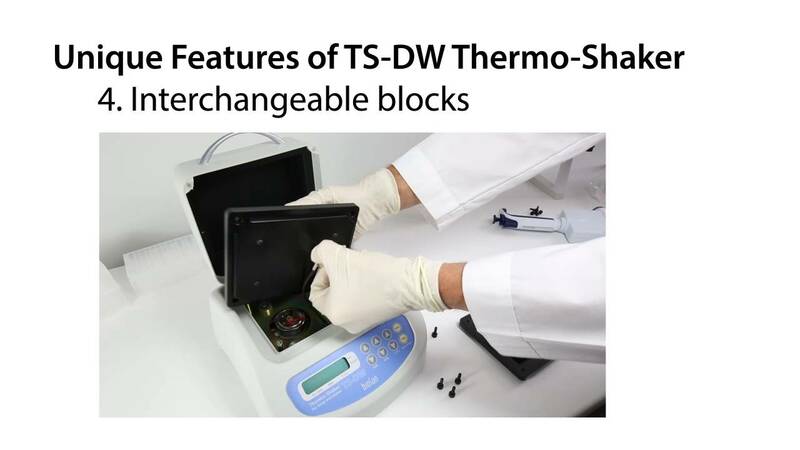 TS-DW provides excellent temperature uniformity across the plate due to patented two-sided heating of the block and the lid, contour heating of the block and close proximity of heating elements to plate walls. There is a number of interchangeable blocks to suit different plates such as Eppendorf® 96/1000 μl, Sarstedt® Megablock 96/2200 μl, Porvair® 96/2000 μl, Axygen® 96/2200 μl. Also we can manufacture a customized block on request.